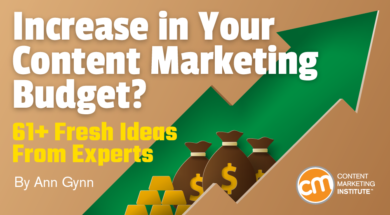 What would you do if your boss unexpectedly increased your annual content marketing budget? What could you do with an additional $1,000? $50,000? $100,000? We asked the presenters at Content Marketing World 2018 to share what they would do. Anna Hrach, strategist at Convince and Convert, offers an insightful grounding thought. “No matter what the budget would be, I would start with a list of everything we wanted to accomplish, then plot them on a grid that ranks efforts from low to high effort and low to high impact. What should be on your grid or wish list? From meals and research to customer advisory boards and in-person event studios, these presenters have a lot of good ideas. First, I hug my boss. $1,000: Boost a digital campaign already driving business-centric results. $50,000: Engage with an industry-specific freelance writer or visual content creator to enhance the content around a strategic business message. $100,000: Invest in a research project with the goal of uncovering meaningful data that can be presented in a white paper, featured on our website, and distributed in snackable bites across all our communications channels. With $100,000, I’d test dynamic content recommendation engines for email. Based on what our subscribers read online, what else should we be sharing via email? $1,000: Spend $750 on video equipment and the rest to buy Jeff Julian a plane ticket so he could teach me how to use it. $50,000 or $100,000: Sponsor events. I’ve wanted to double down on them in the past few years, but as a small consulting shop we haven’t been able to make the math work out yet. BOOM! With an extra $1,000 I’d buy a better microphone and camera for my video productions. With an extra $50,000, I’d hire an editor to ensure my video content isn’t backlogged. Video, video, video. I would hire a small camera crew to republish my best written content in video format. Mobile is for media. More video, more images, more voice, more mobile. Veronica Romney, president/co-founder, LoSoMo Inc.
$1,000: Experiment with advertising on some of the lesser-known sites, like Quora. Or I might try a bit of native advertising for our top converting content. $50,000: Launch an audience research and partial website redesign project. The goal would be to improve conversion rates without hurting rankings. Some of that money would go toward video. $1,000: Take the marketing team to dinner. $50,000: Take the team to dinner and invest in user-generated content efforts to have our customers tell our story better than we can. $100,000: Go to dinner, invest in user-generated content, and host a three-day customer advisory board experience for our 10 most ideal and highest lifetime value customers, and produce more customer story content with them. Conduct interviews with actual buyers to understand the questions they’re asking at each step in their journey. Then develop content that addresses those questions and shows why our answer is better than any of our competitors. I would create a few campaigns focused on creating user-generated content that we could repurpose. I also would use a portion of the budget to get into influencer marketing, primarily finding those with big followings who align with our brand and creating a campaign that we can bring them in on to help create a win-win situation for both of us. $1,000: Take the extra content budget to create an explainer video. $50,000: Create quarterly e-book offers. $100,000: Split between new content tests and paid content promotion like targeted sponsored updates on LinkedIn. $1,000: Take my best clients to the meal of a lifetime. $50,000: Invest in researching buyer/customer expectations. $100,000: Develop a prototype and test a new product/service offering based on what the $50,000 research revealed. Buy native advertising to drive traffic to articles and then quickly grow my email list. Use the rest to set up a good nurture email campaign for ongoing engagement. This could include hiring another role to run this area. Direct mail marketing. Kidding. Sort of. $1,000: Invest in keyword research tools like SEMrush. These are relatively inexpensive but give great insight into content gaps in your competitive set. $50,000: Invest in long-tail keyword paid search campaigns. These campaigns have low competition because most companies spend their advertising dollars on conversion-based content. That leaves a gap for low cost-per-click advertising on thought-leadership content. $100,000: Integrating some personalization technology into our content marketing strategy. Surfacing the most relevant content tailored to that particular user on our website, email, and social media advertising would go a long way to improving engagement. Good evergreen content can be amortized over three to five years. Additional budget in one year can pay off for many years to come. If there is an international fit, translating valuable content into another language could have a huge upside. $1,000: Get access to pro versions of graphic and interactive content creation tools to help augment our written content with more design-rich and aesthetically pleasing graphical derivatives. $50,000: Hire another content writer, and with $100,000 I’d hire two. Dedicated writers and content analysts not only create more content for your organization, but they can also create better content because they can take the time to really understand the industry/market/customer and write to their pain points. I’d rather have two dedicated writers than 50 freelancers or even 50 internal people who write content on the side. Thanks for the windfall. Let’s start small and build. $1,000: Invest in learning in terms of subscription sites to share with others, i.e., Marketing Week, The Economist. $50,000: Invest in print, in terms of taking blog articles and producing a quarterly magazine. $100,000: Invest in a documentary-type film. Pick a topic I dearly believe in, showcasing people and businesses who have built their audience at a grassroots level, not the typical heavy hitters, i.e., Red Bull and Lego. Marketers used to be in the business of acquiring attention. Today, the very best need to hold it. Test several pilots of both video and audio series, then use the remaining budget to produce the winners. Lastly, allocate remaining money towards distribution. For instance, hire a writer to pull out excerpts, write about tangential ideas, distill episodes into lessons and takeaways, and so forth. In summary: Create shows, then raid them for endless content for all channels. I’d hire a video marketing team to create behind-the-scenes videos for my law practice and/or I’d hire a personal assistant to take care of all the tasks that get in the way of me creating more content. $1,000: Book a retreat for my team, where we’d focus on creating some great new content without the interruption of being in the office. $50,000: Give my communications agency some runway to experiment with new PR, marketing, and content programs. $50,000 and $100,000: Upgrade the production value of all my content and focus on custom design and integrations. Hire someone to manage the team, allowing them more time to do what they do best. Look to promote into strategic roles and pay them well for work that moves the business forward. Invest in audio marketing and launch the podcast I’ve been keeping in my “someday” plan. $1,000: Lunch with all our editorial team members – internal subject-matter experts. Content marketing is a team sport and small gestures like this one go a long way towards creating great team spirit. $50,000: Start producing audio content, first by making all our existing long-form stories available in audio. The next step would be audio as a regular new format in our editorial calendar and optimization of our best performing content for voice search. $100,000: Hire a data geek, someone who lives and breathes analytics and data visualization to join our team. $1,000: Provide a spot bonus to my top producer. $50,000: Spend it on a comprehensive white paper that can then be atomized and repurposed all year. $100,000: Hire a journalist to write amazing content and a junior multimedia producer to extend it and squeeze the juice out of great ideas. Invest it in research (will need to outsource the work to India if the budget is only $1,000). This may include surveys, industry trends studies, sales data summaries, or examples of working strategies. Research requires resources. However, it pays off in all digital marketing fields – brand awareness, link generation, content marketing, lead gen, etc. $1,000: Conduct a poll on some issue that is newsworthy yet aligned with the business. $100,000: Fund multiple studies throughout the year to make research part of your brand’s DNA. Any big investment in content marketing should focus on (or at least consider) SEO. After all, what’s the point in having a website full of amazing, useful content if it doesn’t show up in Google? One important area of SEO ignored by a lot of people is link building. Creating content that attracts high-quality links back to your site can improve your rankings and result in more sustainable traffic increases over the long term. With $1,000, you could partner with a starving artist influencer to create some truly remarkable, link-worthy content that could have a huge impact on your link profile and thus your rankings across all your keywords, not just the ones related to the content marketing campaign. With $50,000 to $100,000, I would create an in-house film and sound studio. As marketers, we rely heavily on mass-produced stock music, video clips, and photography. Yet, we could create this content ourselves for far less than we realize. One thousand dollars is enough to contract a sound engineer to integrate the 432-hertz solfeggio sound healing frequency into our existing music. Why sound healing? Because sound healing harmonizes and the gift of harmony is one of the ways I like to surprise and delight customers. $1,000: Seriously? I asked for $20 grand. Well, let’s boost some updates. $50,000: Marketing automation software comes in all flavors and sizes. Let me have a low-end product and spend the rest on content creation and distribution. $100,000: I could really use an experienced editor, as well as budget for freelancers and content distribution. In marketing, there is one universal truth about budget: There’s never enough of it. With $1,000, I would invest this money in building derivative assets from what we have. Sometimes the most effective and impactful work originates out of the need to keep spending in check. A limited budget forces you to make the right choices because there is no room for error. Take what’s working now and expand it. Repeat it. Automate it. More money isn’t going to automatically help you find some new silver bullet. Take what you already know is driving impact and amplify it. $1,000: Do more paid promotions (likely on FB or Instagram). $50,000: Invest in additional production and promotion of an audio/video podcast. $100,000: Hire someone to help generate new thinking, ideas, and content. What would you do with a surprise annual budget boost of $1,000, $5,000, or $100,000? Share in the comments. Not sure yet? Start your priority-impact matrix or at least a running wish list. Join these and other insightful presenters at Content Marketing World Sept. 4-7 in Cleveland, Ohio. Register today and use code BLOG100 to save $100.